Should Pelicans keep or trade the No. 6 pick? METAIRIE, La. -- Dell Demps' six seasons as lead decision-maker in New Orleans have been littered with turnover. There were changes in ownership, first to the NBA itself before Tom Benson purchased the team. Which led to a change in the franchise's identity, from one aggressive flying animal to another. And, of course, a change in superstar, from Chris Paul to Anthony Davis. The conditions have shifted around Demps since he was hired out of the San Antonio Spurs' front office in July 2010, but draft day in the New Orleans war room has often proved to be more predictable than most. That's because the 46-year-old has rarely used his allotted picks as intended. Davis (No. 1 overall, 2012), Austin Rivers (No. 10, 2012), Darius Miller (No. 46, 2012) and Russ Smith (No. 47, 2014), with Davis the only player left on the current roster. The rest of the picks? Traded away to procure the likes of Jerryd Bayless (shortly after flipped for Jarrett Jack), Jrue Holiday and Omer Asik. As a result, the Pelicans are back in the lottery for the fourth time in Demps' tenure. But this year New Orleans is in possession of its own first-rounder for the first time since 2013, when the team flipped the No. 6 pick (Nerlens Noel) and the following year's first (ultimately No. 10) for Holiday. Armed with the sixth overall selection again -- as well as Nos. 39 and 40 in the second round -- will Demps choose to keep the pick and build for the future, or deal it once more in an attempt to try and ensure a more competitive team in the immediate? "The philosophy is to get the best players you can," Demps said Monday, in his first public comments in three months. "I think with each draft you have to analyze the draft. If a situation presented itself where we could get a better player than we can draft that's going to help us in not only the short term but the long term, we would do it. We're going to do what's best for the organization, and we want to make good basketball decisions." 1. The No. 6 pick is one of the 'worst' draft slots. The sixth overall pick has certainly produced its share of notable players, including, most recently, Damian Lillard, who beat out Davis for 2012-13 rookie of the year. But over the past three decades, No. 6 has often been the exact point where value craters. As Doolittle notes, a surplus of project big men -- Ekpe Udoh, Jan Vesely and postseason legend Bismack Biyombo among them -- have historically ended up in the six-to-eight range. And while the NBA's taste in frontcourt players has significantly changed in two years' time, draft sensei Chad Ford has two teenage bigs (Marquese Chriss and Dragan Bender) ranked in the top eight on his Big Board, and four more forward/center types (Domantas Sabonis, Henry Ellenson Jakob Poeltl, Skal Labissiere) in the top 15. 2. The top of this year's draft is said to be weak. Using Ford's tier system -- with Tier 1 equating to an elite prospect, Tier 2 a potential All-Star and Tier 3 a projected starter -- as a base, this year's incoming crop of top picks is a bit lacking in comparison to recent years. In 2014, 12 players ranked inside Ford's top three tiers, with eight in the top two. Last year, it was eight and five (with one Tier 2 player, Emmanuel Mudiay, slipping to No. 7 overall on draft day). This year's class is down to seven prospects in the top three tiers and two in the top two. Making a trade down, like in the hidden-gem 2011 first round, could be a better value play. The Pelicans could need as many as three starters this offseason. Obtaining one on a cost-controlled, cheap deal is nothing to scoff at. But this might not be the draft to go searching for the elite-level running mate for Davis the team has sought since they first started coughing up first-rounders in 2013. 3. Draft picks don't help right away. Some may be more "NBA-ready" than others, but virtually all rookies end up helping approximately the same amount. Which is to say, not much at all. For instance, only two members of the 2015 draft class finished the 2015-16 season with a positive real plus-minus: the Knicks' designated deity, Kristaps Porzingis (2.25), and Karl-Anthony Towns (0.88); in related news, their teams finished with 32 and 29 wins, respectively. The season before, there were three positive RPMs: Jusuf Nurkic (2.33), Smart (2.22) and Elfrid Payton (2.10); only Smart's Celtics cracked the playoff field that season. If the goal is to win now, no matter the rookie, he's unlikely to help the cause. 4. Demps' draft resume is a question mark. It's tough to draw any major conclusions from a sample size of four, especially with half coming in the second round, where the available pool narrows to fliers, specialists and draft-and-stash candidates. But Demps' brief resume in selecting players -- or in the case of Rivers, who has found a role with the Clippers after arguably the worst rookie season in NBA history, developing them -- is currently mixed, at best. The front office has, to its credit, shown a flair for rifling through the scrap heap, with the likes of Lance Thomas, Brian Roberts, Ish Smith and Tim Frazier all emerging as contributors in New Orleans after kicking around elsewhere in or outside of the NBA. But drafting certainly can't be considered a strength based on the track record thus far. Pelicans brass will point to a 9-6 January, when the roster was healthiest, as a sign of life from the rendition that made the playoffs last season. But with Quincy Pondexter and Tyreke Evans on the mend from serious knee injuries, stalwarts Eric Gordon and Ryan Anderson hitting the open market, Asik's recent deal looking more like a cross to bear and Holiday down to his contract's final year, they may have no other choice but to scrap their initial blueprint and start fresh. The timing couldn't be better. 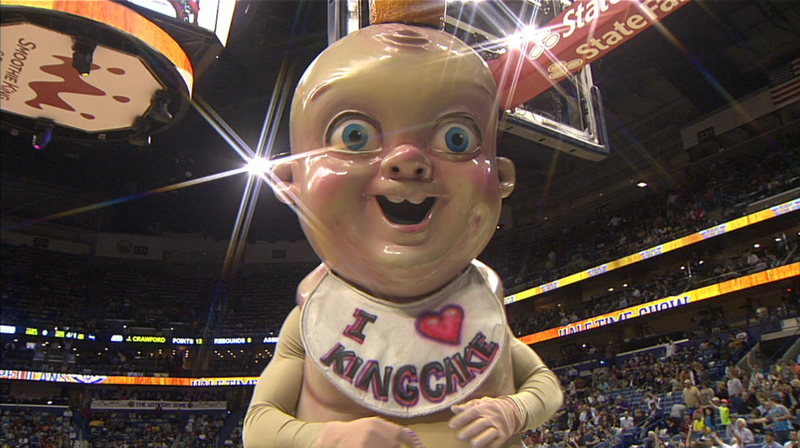 Davis' maximum (non-Rose Rule) extension will kick in next season, guaranteeing at least four more years of his service under the lordship of King Cake Baby. Though Davis probably wouldn't appreciate punting another season, especially with his recent efforts to spread his branding wings, all parties may be better off if he and a group of young players were allowed to grow into something significant. 2. Top picks may be more valuable than ever. With the salary-cap boom expected to give even an average 3-and-D wing on this summer's free-agent market a Cinderella sheen, top picks -- and their four years of service at reduced, fixed rates -- represent an even greater value than usual. According to Kevin Pelton's calculator, Ben Simmons' projected contributions will be worth an estimated $64 million, but, if picked first overall, he'll make at most $26.2 million over the lifespan of his rookie contract. That type of bargain has a cascading effect, making all of the other front-office plate-spinning just a bit less taxing. With the glut of talented young'uns brought in through the Paul trade and the losing that brought with it virtually all gone, it might behoove the Pelicans, who won't have a single rookie deal on their books outside of any forthcoming draftees, to cash in on the savings, especially with only Davis, Pondexter, Asik and Alexis Ajinca guaranteed for the 2017-18 season. The No. 6 pick, per Pelton, would have a net value (value of production minus salary) of about $21 million. 3. New Orleans is not a free-agent destination. Here's a game to play: Can you name the last free agent with a career PER 15 (i.e., league average) or above whom New Orleans signed outright as an unrestricted free agent (i.e., not through Bird Rights or a sign-and-trade)? The answer: Bobby Jackson, then 33 years old, in 2006. While muffulettas, District Donuts and Davis' rising star may have helped attract sportswriting free agents last season, New Orleans hasn't curried much cache in player circles in the Hornets/Pelicans' 14 years there. And after a 30-52 season dropped them to four losing seasons in the past five, the franchise doesn't have the sort of recent success that helped Milwaukee pull off an upset victory in last summer's Greg Monroe sweepstakes. All that cap space -- as much as $24 million, according to recent estimates -- won't do much good if there's no one to spend it on. Given the collective bargaining agreement's built-in incentives for keeping your own players, building through the draft, then, would seem prudent. 4. This could be their last lottery pick before Davis' deal is up. The second-most games lost to injury and illness in the past decade amounted to only the sixth-worst record in the NBA last season. Given their emphasis on capitalizing on the present in the Benson era, outside of injury to Davis it's unlikely that the Pelicans would be able to bottom out further and/or again. Free agency doesn't yet appear to be an artery for front-line talent (see above). And, as Pelton notes in his analysis of a potential trade of the Lakers' No. 2 overall pick, only a superstar like DeMarcus Cousins, whose value far exceeds the restrictions of a max contract, is worth the price of a quality pick. Which leaves this draft pick as perhaps the last chance the Pelicans have to swing for the fences. 5. The fear of repeating a vicious cycle. Davis' second contract hasn't even begun and the worriment over the Pelicans' ability to keep him around for a third has already become the preeminent talking point. Such is life in a small market, especially one with the effects of the Paul trade still lingering. But the franchise has shown neither consistent success nor a clear path to getting there to make Davis' departure anything less than an inevitability. Not every winner comes at the price of a full-blown gut job; new "special adviser" Danny Ferry, for instance, built a 60-win team in Atlanta around Al Horford without a single lottery pick. Yet eschewing the draft altogether, as the Pelicans essentially have in the Demps era, raises red flags, to the rest of the league and the fan base, about the organization's willingness to commit to a long-term approach and accept that its basketball team requires a different worldview than the one employed by the football team with which it shares a compound.